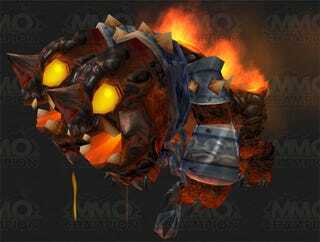 World of Warcraft players who use Blizzard's authenticator gadget to secure their accounts are being gifted with a two-headed fire dog so cute it almost makes up for all of those Molten Core raid deaths - almost. The Blizzard authenticator is a device that generates a one-time code that secures your Blizzard account from unauthorized access. The device costs $6.50 at the Blizzard store, and are given away in great numbers at BlizzCon, the company's annual fan celebration. Apparently being cheap as hell and sometimes free isn't enough incentive for some people, so Blizzard is passing out the baby Core Hound in-game pet , seen here in an image from MMO Champion, as an incentive. Anyone who adds an Authenticator to their account or has already done so scores the pet, which should see the little keychain fob devices being activated left and right. Seeing as my World of Warcraft account has been hacked at least twice now, you'd think I would have used one of the many Authenticators I've had laying about from the past two BlizzCons by now, but no. Now that there's a fire dog involved, however, expect to see me digging through boxes of random junk in my closet later today, desperately searching.